Papua New Guinea is on the brink of it’s biggest resources boom. Will it be a curse or a blessing? A new generation of mining projects and a massive LNG project are expected to double the size of the economy over the next decade. Yet there is skepticism about whether benefits will be shared widely among the nation’s seven million people. This is the third resource boom in as many decades, and despite the promises of the past, incomes today are barely higher than they were at independence in 1975 and PNG is unlikely to meet any of the MDGs. Some argue that PNG has a classic case of the resource curse: Dutch disease, weak accountability and corruption, which all conspire to undermine economic, social and political development. A key question is how to break with this past experience and chart a new development path? The formulation of medium and long term development (and expenditure) plans on how to translate resource revenues into infrastructure and basic services. The PNG Department of National Planning and Monitoring provided a detailed overview of these plans for the Development Policy blog. A debate about governance: the accountability, capability and effectiveness of government to deliver on its promises. This is reflected in some of the comments from Paul Barker at the Institute of National Affairs, and also featured here and hereon the Development Policy blog. Nor do I think a lack of planning is a big problem for PNG. The government has both long term and medium term development plans and a raft of sector and thematic plans, including one for the informal economy. We can debate whether or not these focus on the right policies, but most commentators would agree that the main problem is a lack of implementation. There needs to be debate about and fine-tuning of macroeconomic policies and development plans, but the challenge is how to implement them and that brings us to the issue of governance, and the potentially corrosive impact of resource revenues on accountability, transparency and government capability in the delivery of services. During the latest resources boom, indicators of the quality of governance declined. 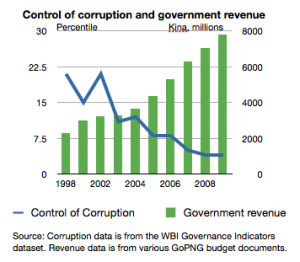 PNG is now in the bottom 5% of countries in terms of control of corruption. We need a lot more ideas on how to improve the accountability, transparency and government capability if we are to reverse this trend. This includes evaluating existing approaches, such as aid, to improving governance. For example, a recent review Australian aid to PNG found that ‘several sources of evidence, from the decline in national governance indicators to a wealth of evaluation materials, and international analysis as well, suggest that the “capacity building through advisers” model is not working.’ If aid is not the panacea, then what? There isn’t a single solution. Ultimately the key drivers need to come from within PNG and not from donors. There needs to be more debate about how to create the conditions for the emergence of stronger accountability, transparency and capability. The key to this is empowering citizens to hold government to account. One idea is to share the benefits of the resources boom more widely and create a stronger constituency for government accountability. In an article for the National Research Institute, Ron Duncan picked up Todd Moss’ Oil to Cash idea and suggested that an ‘Alaska model’ of universal cash transfers could be implemented in PNG. Of course, implementing universal cash transfers is easier said than done, though not beyond the realm of possibility. The government is already considering a unique ID card program that could be used to identify beneficiaries, and rapid progress in rolling out mobile telecommunications could provide a cheap platform for making payments. It’s something that deserves further consideration. And in the meantime, there are other ways to share benefits more broadly. The 2002 free education program was positive: more money reached schools and enrollments increased. Another idea relates to how to empower citizens to hold governments accountable, and to enable governments to get better information to feed into policy. Opinion polls in Australia provide this kind of feedback to political leaders. While sophisticated instruments like this are not yet available in PNG, there are alternatives. During the current sitting of Parliament, Sam Basil, the deputy opposition leader, posted a picture on Facebook of an empty parliament chamber. Within just an hour more than 50 people had posted comments of dismay at the performance of MPs, and by the end of the day there were over 100 comments. Finally, what can be done to improve transparency? PNG has quite detailed budget documents, but where the money actually goes is less clear, a problem that is highlighted in the Parliamentary Accounts Committee’s scathing comments. And there are other areas where more transparency is needed. PNG is not yet a signatory to the Natural Resources Charter or the Extractive Industries Transparency Initiative, global standards for publishing revenues from the resources sector. Despite a great deal of donor support, the statistics office has a poor record of conducting and publishing statistical surveys on things like demographics, health and households incomes. Government has already done the hard yards of collecting this data, perhaps all that is needed is a nudge to get it into the public domain. These are some suggestions about how to improve governance. Its naive to think that improvements will be easy or that they will happen automatically. A concerted effort by all stakeholders – government, donors, NGOs and citizens – is needed. Fortunately, information and new technologies are creating opportunities for change: from cash transfers, to crowdsourcing feedback, to social networks for advocacy. As Rowan Callick commented in a recent article, if PNG and its supporters have the commitment to chart a new development path, the country can be ‘wired for change‘.